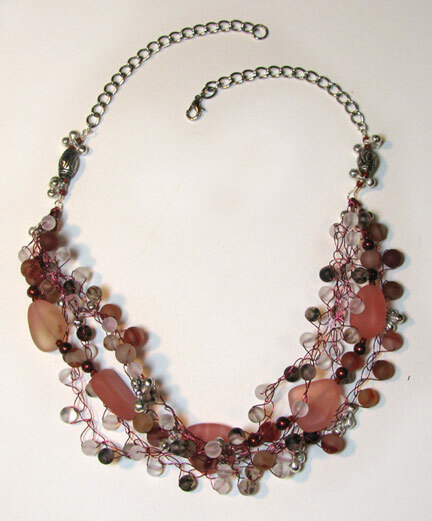 Using the sea glass beads that I received from Auntie's Beads, I made this cute lightweight necklace. It jingles slightly because of the Indian bells, and there is just a lot of movement in general since the crocheted wire is so flexible. 1. Follow the basic instructions for Blue Bells and crochet the clear, black marbled, and red marbled rounds onto red craft wire, interspersed with clusters of three Indian dancing bells. Leave 4 to 5 inch wire tails at the ends of each strand. 2. 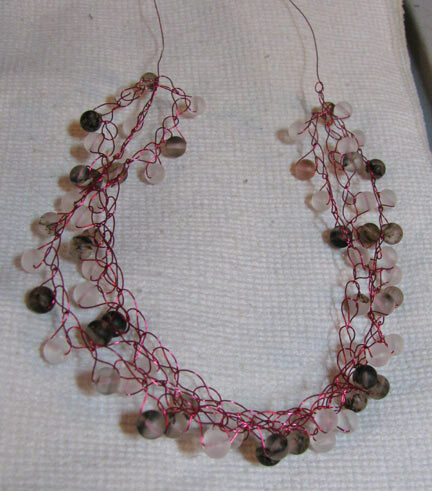 String one strand of the heavier beads, including the nuggets, some of the red marbled rounds, pearls, and seed beads onto SoftFlex. 3. Create a wrapped loop with a 4 to 5 inch piece of silver colored wire, and crimp the SoftFlex strand around it. Repeat for the other end. 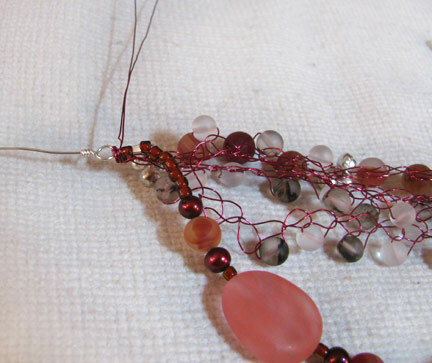 Wrap the wires from the crocheted strands around the loop and wrap down the strand to tighten. Clip ends close. 4. Add some seed beads, Indian bells, and a large bead to each wire, creating a wrapped loop at the other end. 5. Use jump rings to attach chain to each wrapped loop. Add another jump ring to the end of one piece of chain and attach the lobster claw clasp to the other piece with a jump ring. As regards FTC disclosure guidelines: I have received the sea glass beads free of charge from Auntie's Beads in order to create a project free of charge for you. I have not been paid for my endorsement as it pertains to the products received. Very pretty...looks southwest to me..
and mine didn't even include crochet like yours. Auntie's Beads should hire you full time as a designer! This is gorgeous. It's just beautiful Cyndi! I love the colors, the beads are gorgeous, and as always, your work is amazing! Those beads are gorgeous!! I'd love to see what this looks like on!! I really like this. I like the colors, but you have it arranged so beautifully so it all comes together and looks wonderful. Lovely design. I have some seaglass I have been wanting to use. Thank you for the great inspiration. Also have just started working with leather and the great book you are giving away would be a wonderful inspiration,also.Would be so thrilled to win it! There's no reason at all why you couldn't substitute fine silver or gold wire, except for cost. 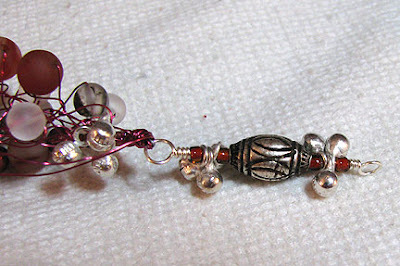 www.riogrande.com is one really good source for wire and metal, including metal beads.